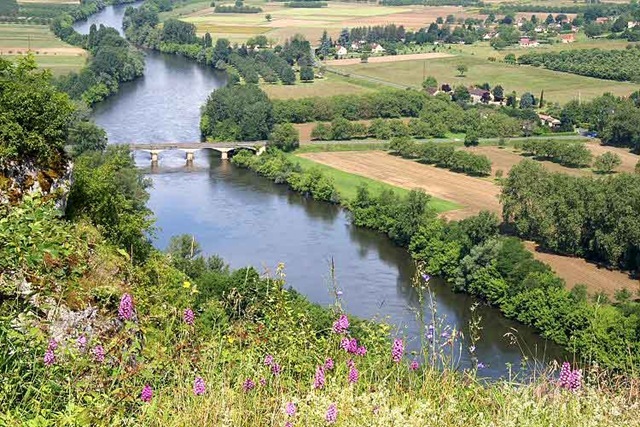 Being one of the fortified bastide towns, Domme stands high on a bluff overlooking the Dordogne. Our campsite is halfway up a similar hill. On a previous trip we had been very French and cycled up the long drag to Domme. (A true Frenchman really isn’t cycling unless going uphill.) Having done it once, we weren’t relishing a repeat performance but were unenthusiastic about driving the mere three miles. Enter our friendly Dutch neighbours armed with a detailed walking map of the area. It showed a back route linking our hill with the Domme hill without descending all the way into the intervening valley. Bravo! Today was market day so off we set and a very pleasant route it turned out to be, too. Naturally, there was some up and down involved and we cycled triumphantly through the 13th century gate into Domme before dismounting for the very steep streets within the town walls. Both the town and the market exist for tourism now but it is well worth a look, nonetheless. There were yet more pyramid orchids at the belvedere overlooking the Dordogne and, today’s first ornithological spot, some sand martins whirling about nesting in the cliffs. Had there been any asparagus on the market we would have bought some to grill for lunch but, alas, asparagus was there none. 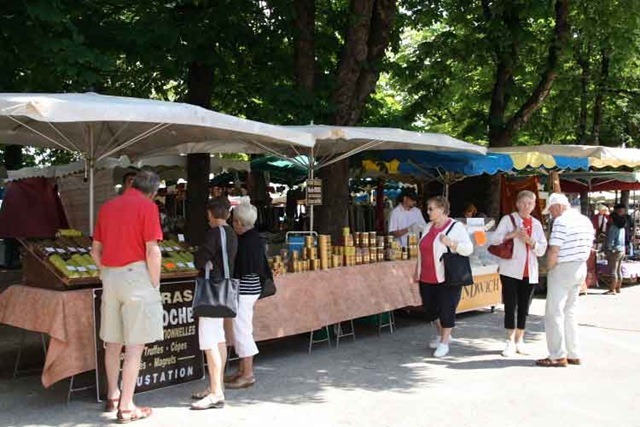 Both the market and permanent shops sell a lot of the Perigord specialities associated with raising ducks and geese for the fois gras, things like confit de canard (preserved duck legs), confit de gesiers (preserved gizzards) and bottled cassoulet au graisse d’oie (haricot beans and meat flavoured with goose fat); all delicious and all fattening. We resisted buying anything but a baguette for lunch. Swallows were whirling around above the central square, in the middle of which stands an old wooden-framed hall which I took to be the old market hall. The swallows were flying in and out of the old hall between the supporting timbers. 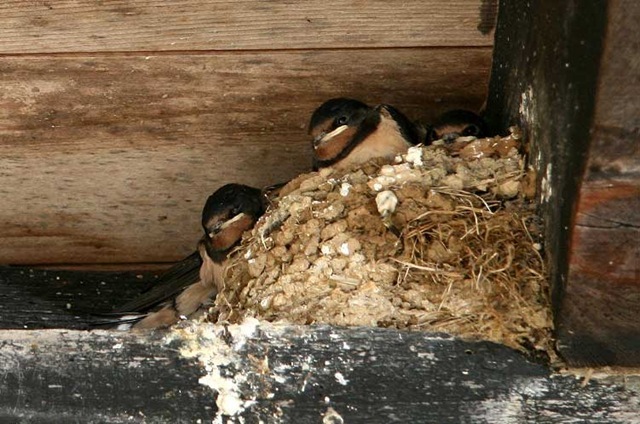 Sitting atop some of the beams were their mud nests with small swallow heads peering out waiting to be fed – painfully cute.